“The New Lady in Waiting” reexamines the transferable concepts which have been so helpful and encouraging to over a million women in the original edition of Lady in Waiting. The authors have added fresh new insights for a new generation of readers. This is an important book for readers today faced with the challenges of a changed and changing culture at a time when core Christian values are being challenged by public opinion and influenced by Reality TV entertainment and Social Media. The focus on finding fulfillment for the longing of the heart through a relationship with Jesus continues to be the focus of the book. Lessons are taken from the example Ruth in the Old Testament. Kendall identifies ten qualities of a godly woman. Each chapter includes powerful teaching, hands-on illustrations, and reflective questions for contemplation and application. Kendall’s writing is entertaining, forthright, candid, and compelling. Principles are relevant, Biblically based, practical and workable. She is a gifted story teller and has included dozens of unforgettable short stories taken from real life. 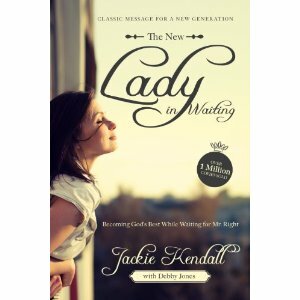 “The New Lady in Waiting” is for every woman, regardless of age or station in life who wants to fulfill God’s purpose and find His best. Highly recommended. This entry was tagged Relationships. Bookmark the permalink.